The Claremont station is part of the Foothill Gold Line from Glendora to Montclair, and will be located approximately where the current Metrolink station is located today; east of Indian Hill and west of College Avenue. The existing Metrolink station will be relocated east of College Avenue. The Gold Line station will be a center platform station, with light rail tracks on either side (one for westbound and one for eastbound trains). The Claremont station will have an associated parking facility, and have amenities for riders arriving by walking, bicycle, bus and drop-off. Once completed, four tracks will run through the City of Claremont within one shared corridor – two light rail tracks on the north side for the Gold Line and two Metrolink/freight tracks on the south. While they will share the rail corridor, light rail trains and freight/Metrolink trains do not share tracks or stations. Permanent changes will also occur due to the project, including safety enhancements at all street crossings (raised medians, red curbing and turn restrictions within 100 feet of the rail corridor at all street crossings), relocation of the freight track to the southern half of the rail corridor, new fencing and walls along the entire rail corridor, and new overhead lines to power the Gold Line system. 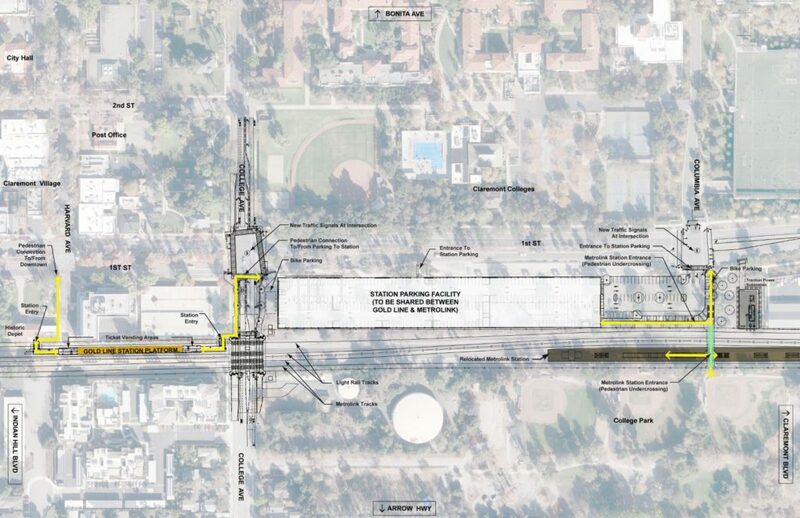 The Claremont Metrolink Station will be moved from its current location west of College Avenue to several hundred feet east of College Avenue, and the Gold Line tracks will be grade-separated on a city-designed bridge over Indian Hill Boulevard. Once completed, a trip from Claremont to Pasadena will take approximately 36 minutes and further to downtown Los Angeles will take approximately 65 minutes. Joyce Kohl is an accomplished artist based in Altadena, California with experience in cast iron and metal sculpturing. In 2004, she completed a major sculpture utilizing cast iron artifacts from farming, shipping and industrial machinery for a Park & Ride in DuPont, Washington. Other work includes a set of sculptures for the San Joaquin Valley Centennial Celebration of the two major industries in the area – farming and oil. Joyce also designed and created the tile and sculptural AIDS Wall in Zimbabwe. Joyce graduated with a Masters of Art from California State University Fullerton and is the past recipient of the Fulbright-African Regional Research Grant, Zimbabwe, and the John Simon Guggenheim Memorial Fellowship. Joyce’s art concept is derived from her conversations and experience in the city and her conclusion that Claremont has an astonishing number of people (within the colleges and community at large) who are thinking “outside of the box” – in a vast number of fields, utilizing many languages. The most prominent element of the station artwork will be an internally illuminated iconic landmark located at the corner of First Avenue and College Avenue, near the entrance to the station parking facility. The sculpture is planned to be 16 feet tall and give the illusion of line drawings of two boxes, back to back at skewed angles. The boxes will have cut letters, symbols and numbers from the different ‘languages’ spoken in Claremont etched into plexiglass. In the second element, Joyce will create handmade tiles installed on the canopy column bases of the station platform. Each image will represent a story from Claremont and will link to videos or websites prepared by Claremont communication students on these prominent subjects. People showcased will include scientists, medical researchers, artists, musicians, social scientists, various educators, experts on religion, historians and creative writers. 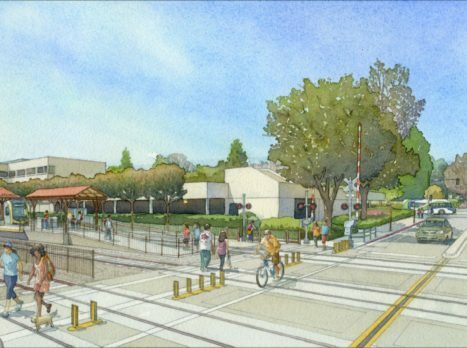 During 2006-7, the Construction Authority worked with the City of Claremont (along with all other Foothill Gold Line cities from Pasadena to Montclair) to explore their visions for integrating transit oriented developments (TOD) near the future station. A premiere example of transit-oriented development along the Foothill Gold Line corridor is found in Claremont with the Claremont Village Expansion project located just west of Indian Hill Boulevard and immediately north of the current Metrolink and Foothill Gold Line right-of-way. Village Walk: This “new-urban design” residential neighborhood of 173 homes includes condominium lofts, town homes and duplexes, and open space areas. The Packing House: Arteco Partners, recognized in the region for successful adaptive reuse projects and in particular for support for creative arts communities, was selected to bring new life to Claremont’s historic 1922 Citrus Packing House. The project, which officially opened in April of 2007, shines within this TOD for its detailed architectural renovation and a variety of creative storefronts and arts/entertainment venues. The Shops and Offices, directly across the street from Village Walk and The Packing House further expands office, retail and entertainment opportunities for the City of Claremont, and includes a five-screen, 816-seat Laemmle Theater complex and Casa 425, a 28-room boutique hotel. A 477-space parking structure supports the TOD with 6,000 square feet of retail space on Indian Hill Boulevard. Located 30 miles east of downtown Los Angeles, Claremont is best known for its tree-lined streets, historic buildings, and college campuses. 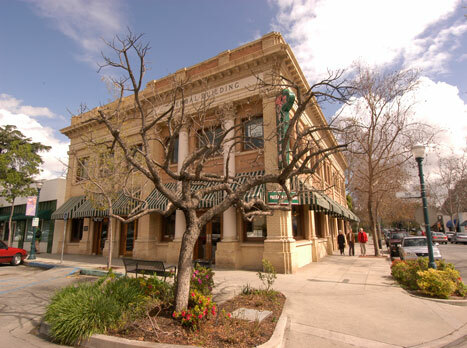 But more than that, Claremont is a vital balanced community that provides a wide range of programs and services for all age groups and preserves a full range of housing opportunities. It supports a variety of thriving commercial and industrial centers and protects the environment while encouraging appropriate development. In short, it respects traditional values while embracing new ideas. 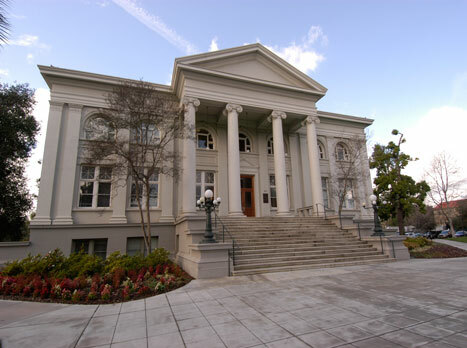 Much of what Claremont is today is the direct result of actions taken by the community’s founders more than 100 years ago. Trees planted at the turn of the century now compete with nearby mountain peaks for dominance of the local skyline. 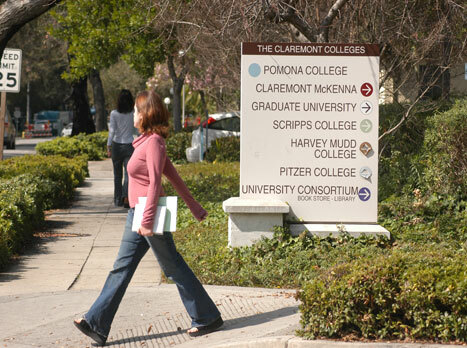 The Claremont Colleges have become some of the nation’s most highly respected educational and cultural institutions. The historic central core remains a vital residential and retail district, one of the last true “downtowns” in the region. And the spirit of Claremont’s original “town meeting” form of self-governance lives on in today’s active and involved citizenry, citizens who continue to build on the successes of the past in order to ensure an even brighter future.